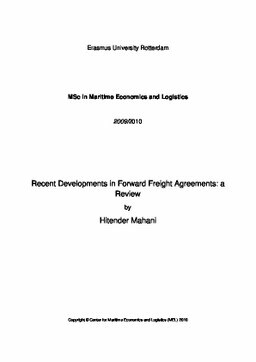 The size of the Forward Freight Agreements market for dry bulk shipping routes has seen a substantial increase in the past years. Though hit by the global sub-prime housing crisis, the trading volumes in 2010 are expected to double, compared to 2009 levels. This increase in volume of paper market could potentially influence the physical spot markets dynamics. This paper investigates the short term effects of FFA trading on Spot Markets in Dry Bulk shipping. This analysis aims to understand firstly if a relationship between the two markets exists and secondly, if it does, how do the two markets affect each other in terms of future movement. Due to the confidentiality and anonymity as the basic principle of FFA trade, the availability of data is scarce. Hence the paper analyses the research question through the analysis of existing published research and its conclusions. The analysis is done following three important criterions: (a) cointegration relationship (b) causality relationship (c) predictability of spot rates using FFA prices. The cointegration relationship as the first step provides an indication if a relationship between the two markets is present or not. This is important since if no evidence of cointegration is found, then the FFA and the spot market would move independently and there would be no effect of one market on the other. The causality test helps to determine which market guides or causes the other market. In case of no unidirectional causality, this test helps to identify the extent the two markets affect each other. The predictability relationship is an indication of how well one market can predict the future outcome of the other market. The results point to the existence of long-run cointegration between the spot and FFA markets. This, in conjunction with the causality relation, points to the fact that even though bi-directional causality is observed, generally the spot rates lead the FFA rates. Also an important observation is that since the FFA rates adjust to a greater extent to attain the longrun equilibrium than the spot rates, hence the FFA markets act as an important point for information assimilation. In one finding, it is also concluded that in periods of high volatility, spot rates lead the FFA rates while in periods of low volatility the FFA rates lead the spot rates. Tests for prediction of spot market movements using FFA highlight the fact that the FFA alone do not provide a good estimate for future spot prices. These when used in different models such as Vector Error Correction Model (VECM) in conjunction with past spot and FFA rates, the predictability of future spot prices is considerably improved. Thus in the short term, we observe that even though the FFA markets are important point for information assimilation, the leading role is played by the spot market and the FFA market adjusts to reach an equilibrium.